Beyonce has fired shots at Kim Kardashian. The singer, in her newly released track with DJ Khaled, Top Off, threw shades at the reality star. She made reference to Kim Kardashians' 2014 Paper magazine cover 'Break The Internet', where she stripped naked. 'I'm the only lady here, still the realest n***a in the room. I break the internet, top two and I ain't number two,' she sings. 'My body, my ice, my cash, all real, I'm a triple threat, she continued, making reference to Kim's body which rumour mongers say was gotten through plastic surgery. Kim had however denied she had any surgery done on her show, Keeping Up With The Kardashians. The two successful women haven't been best of friends despite being married to two bestie. 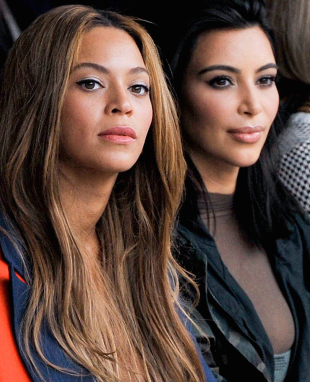 Beyonce has hardly hidden her disdain for Kim. In 2014, Beyonce and her husband Jay Z, who was Kanye's bestie at the time, refused to attend Kanye and Kim's Italian wedding and instead, spent the day posting photos of themselves relaxing in New York.